Summertime is for picnics, trips to the swimming pool, and having a blast on vacation. Dealing with pests is probably not on your bucket list this summer. However, with warmer weather comes insects, and this summer, it is in your best interest to be proactive about pest control. 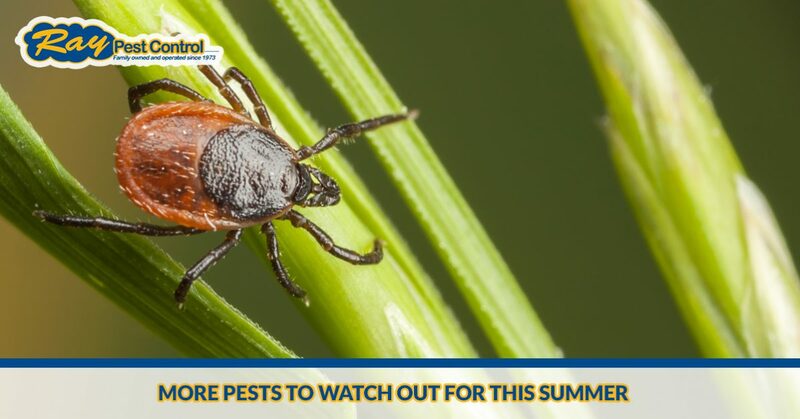 In our previous blog, we started going over some of the pests you need to watch out for this summer. In this blog, we will continue the list. Ticks are a common problem in the summer, and a dangerous one. They could cause harm to your family or your pets because they can carry with them some serious diseases. Ticks hide in grass, making it easy for you or your dog to accidentally act as a host for them. It is in your best interest to take steps to prevent ticks, and if you find ticks in your yard, it is best to call the pest control professionals at Ray Pest Control to eliminate the issue on your Piedmont property. In the meantime, here are some ways you can prevent ticks. Ticks prefer long grass to hide in, so it is wise to keep your lawn mowed during the summer. The ideal length of grass is three inches, so you should mow when your lawn is around 4.5 inches long. How often this requires mowing will depend on how quickly your specific type of grass grows. Ticks love moist environments, so if your lawn is overwatered or not draining correctly, it could be attracting these pests. Refrain from watering your lawn to the point where it is very damp. Additionally, if it is an issue of drainage, you may consider aerating your lawn. Cedar is a tick repellant, so laying down cedar mulch may help protect your lawn from them. Create a barrier around where you and your pets like to spend time in order to keep them out of your space. You might also create a barrier around the edges of your lawn to stop them from entering your property at all. One way to address a tick problem is by attracting their predators to your lawn. Birds love feasting on insects of all kinds, including ticks. Planting native plants and keeping your grass neatly trimmed will attract birds. You may also consider hanging a bird feeder, but keep in mind that birdseed can also attract squirrels, which carry ticks. Yellow jackets are wasps that nest in the ground and are incredibly protective of their nests. This means that when people get too close to their home, they strike immediately, and can sting many times very quickly. While this is not life-threatening unless you have an allergy or have been stung many, many times, these stings are incredibly uncomfortable and you certainly want to avoid the nest. If you find a yellow jacket nest on your property, it is best to call a professional pest control company like Ray Pest Control to take care of it for you. A professional has the tools and experience necessary to remove this pest without being stung. In the meantime, here are some ways to repel yellow jackets. Yellow jackets are fond of human food, particularly protein. This means that it is best to keep your food, particularly meat, inside rather than enjoy it outdoors. If you store pet food outside, make sure it is done in a way to prevent yellow jackets from feasting on it. Once fall comes, you should also keep in mind that yellow jackets begin to add sugar to the list of things they love to eat. Sugar makes yellow jackets live longer and improves their reproductive function, so you definitely don’t want them getting into your lemonade. Keep your picnic inside if yellow jackets are a concern. The yellow jacket will scavenge for food if necessary, though they are usually hunters. If your trash can is easy to access, it may be the perfect place for them to find a feast. Make sure that your garbage is well-sealed in the can to prevent these pests from entering the can. Yellow jackets will not put their nests anywhere there is already a nest. You can trick them into thinking that a yellow jacket colony has already taken up shop on your property by hanging up a crumpled up grocery bag by your doors. They will not be able to tell that it isn’t a nest because they will not attempt to approach it, and they will move on to find another place to nest. Need help keeping summer pests out of your life this summer? Ray Pest Control can help. Contact us for pest control experts in Piedmont.